If you’ve lounged on Cherry Esplanade or strolled through the Plant Family Collection or Osborne Garden, you’ve surely noticed the Garden has lovely and resilient lawns. What you may not know that they’re thriving without any chemical fertilizers or pesticides. What’s more, you can use some of the same strategies BBG uses for a healthy, sustainable lawn of your own. “Fall is the best time to do most of these things. We’re right in the middle of our own ‘turf week’ now,” says John Kneisel, BBG horticulturalist and turf specialist. Read on for some tips you can use at home. Compacted soil creates drought-like conditions by preventing water and air from penetrating. Lawns are particularly vulnerable if they get a lot of foot traffic. Applying unsterilized compost to your lawn is one way to loosen up the soil because it contains worms and other organisms that will create air pockets as they move through it. Compost tea can also be used—it contains beneficial microorganisms including fungi and bacteria. Both offer plenty of other benefits, too. You might also consider hiring a lawn care company to core-aerate your yard annually in the fall or spring, especially if you your lawn is large, has a build-up of thatch, or takes a lot of abuse. “There are all kinds of contraptions out there, like shoes with spikes on the bottom, but it’s best to have a professional do this. They’ll have the right machinery for pulling small plugs of soil out and creating opportunities for air and water to penetrate deeper into the soil,” says Melanie Sifton, vice-president of Horticulture. Applying compost and/or organic fertilizer afterwards will reinforce the benefits. Fall is the best time to reseed bare patches, ideally just after you’ve aerated and before you apply compost. A healthy lawn might contain a variety of grass species, and it’s important to plant the right mix for your region and conditions. BBG uses a cool-season mix of mostly tall fescues (which are drought- and traffic- tolerant), along with some Kentucky bluegrass cultivars, and ryegrass and fine fescues. Most commercially sold bags of grass seed are also mixtures, customized for particular conditions (sunny, shady, etc.) and by region, generally either warm- or cool-season dominant. Warm season grasses are usually best for the South and go dormant (and brown) in the northeastern winter. Cool season grasses tend to be more appropriate for Northern climates and go dormant in the hottest part of summer if you choose not to water them. In Brooklyn, either can be appropriate, depending on which dormancy period you prefer. “Don’t be afraid to let your yard go brown for this time. Often the most sustainable choice you can make is to not water it during its dormancy. It’s part of its natural cycle and it will green up again when it’s ready,” says Sifton. In addition to planting a mix of grass species, you can also allow some clover to grow in your lawn. Although many herbicide companies list clover among the “weeds” that their products fight, it is actually a good plant to include in moderation in a lawn. “It takes nitrogen from the air and releases it into the soil, which benefits the grass. It can also serve as a good indicator that you have nitrogen-poor soil. If you have an overabundance, add some compost to tip the balance more toward grass.” Hand-pull weeds like crabgrass, nutsedge and dandelions. Maintaining well-aerated soil with the right pH will also help keep weeds in check and encourage stronger turfgrass. Don’t cut your grass too short or too often. Setting your mower to 3.5 inches will allow roots to penetrate deeply, which will make your lawn more resilient in times of drought or other stress. If possible, use a mulching mower or a regular mower with the bag removed to “leave it on the lawn,” and add additional fertility instead of taking it away just to add more fertilizer again later. “You can cut your fertilizer use by one third just by doing this,” says Kneisel. 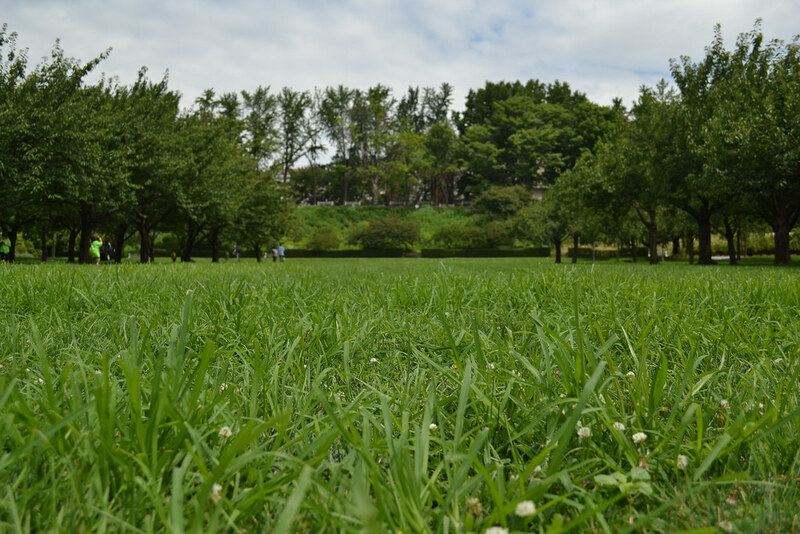 No chemical fertilizers or pesticides are used on the Garden's lawns. Photo by Blanca Begert.